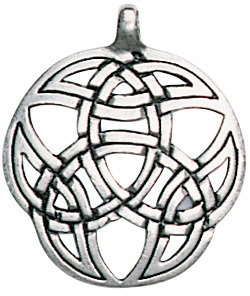 This open ribbonwork trefoil represents the Web of Wyrd woven by the three Norns, Norse goddesses of Fate. Vikings believed that each one could influence his future but all were subject to the cosmic destiny of Wyrd, spun by the Norns with the skein of life. For Developing Potential. 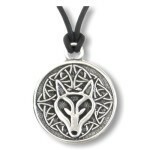 Made of pewter and provided with a chain. Approximate size: 1Â¼" in diameter.